Issues concerning Downtown as described by the Downtown Council. River to 31st Street, I-35 to Bruce R. Watkins. It didn't make the news (even though a similar accident in the Plaza did), but a woman and her child were struck by a car at 12th & McGee yesterday as they were walking to the Argyle. Those construction barricades along 12th for Traders and Grand are a menace with the reduced sight lines. If you're walking, or driving anything shorter than a large SUV, it's very difficult to see approaching 12th street traffic. Oh, I'm sure it was done on purpose. Interested to see the official response. I assume I'll get a generic blow off resolution. It might be related to O'Neil bridge rehab. Looking at the 311 map there are a lot of reports of the signals not changing....even when pushed. Warms my heart! KCPowercat wrote: Looking at the 311 map there are a lot of reports of the signals not changing....even when pushed. Warms my heart! I was one of them! Crossing Broadway eastbound on the south side of 12th worked for me yesterday. I pressed the button, so not sure if it would have been automatic. Someone else reported on Twitter that they weren't working at all. 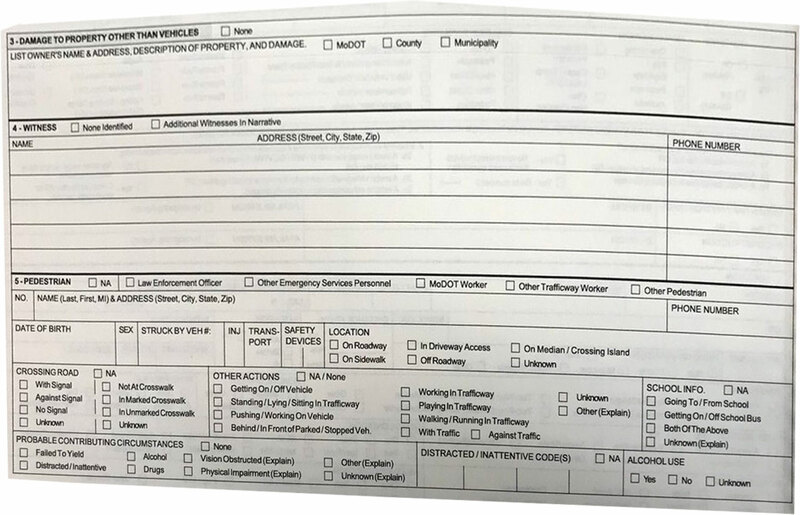 I managed to get some photos of the official state crash reporting book currently being used at the KCMO police academy and I found one page that explains a lot. When hit by a car the state lumps 99% of pedestrians into the "other" category. that's basically unreadable....be interested to see a proper shot of what you are trying to show there, I think it has value to explore. I tried to fix the picture in Photoshop, but now that it's legible the point being made is lost on me? Last edited by tower on Fri Aug 03, 2018 12:53 pm, edited 3 times in total. Except, on the line above that, "On Sidewalk" is one of the options for where the pedestrian was struck. Was all over downtown for the first time in about six months and have a few thoughts. 1) Living outside of KC and only visiting a few times a year makes day to day changes more noticeable. There has been a big pick up in the number of people downtown. While certain areas are busier than others, you can't go more than a block or two without running into people on the street. A lot of progress needs to be made but please keep in mind downtown was a ghost town 10 years ago. 2) River Market is by far the most pedestrian-friendly part of KC for locals and tourists alike. The area still lacks essential services like bodegas, banks (yes, banks...), and retail but the influx of restaurants is a great start. This a ton of space for more development between surface parking lots and smaller buildings. This narrative can be found all over downtown but I predict most urban infill will take place in RM due to spacial constraints (highway and river) as well as walkability. 3) Bird / Lime will drastically change things and help facilitate this change. 4) More parks, trees, and green space are needed. There are few (if any) central meeting places downtown. This is essential for a thriving community and capping the loop (on north and south) will really help bring the community up. 5) This is just the beginning -- so exciting to see these changes take place. As more people move downtown, businesses will follow and hopefully things will continue! I'm tired of being "just the beginning" part of downtown rebirth....I'm not getting any younger! All that form says is documenting if a pedestrian was involved or not. If no pedestrians, they check N/A, if there is, they choose if it was someone that has specific laws against being hit. KCPD deserves a lot of ragging but this isn't one of them. Bothering them on this isn't helping our cause. I'm actually impressed how much detail they document. This is a state form so every dept in the state, not just KC, can use this. They want more information on the kind of bus involved that gathering information on the kind of pedestrian. That’s left to the notes which has to include the sequence of events too. This would be a good source of better pedestrian crash data if it was more interested in describing who this pedestrian is. The officer doesn’t need to see a person’s disability situation as contributing to check a box stating they’re disabled. But if there’s continued accidents involving people with disabilities near a nursing home it shows a trend in an area of an at risk population more likely to be killed in an accident. Right now they gather only age in this section and age doesn’t tell everything. Barking up the wrong tree with this. Please stop.